These clear acrylic sheets are a safe and inexpensive way to teach the principles of printmaking in the classroom or as a great alternative to fragile glass in picture framing. 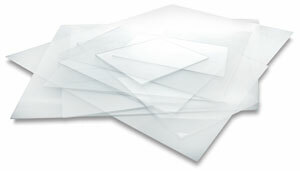 The acrylic sheets are pre-cut into standard frame sizes and have a non-glare finish on one side. Use them with monotype inks, acrylic paints, or other media to create printable images. The 18-gauge sheets are approximately .06".